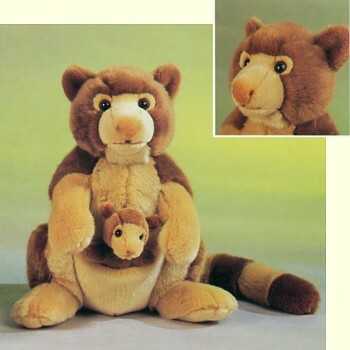 Premium quality soft plush stuffed Tree Kangaroo with Baby from the Leosco Save Our Space collection. Tree-kangaroos are macropods adapted for life in trees. They are found in the rainforests of New Guinea, far northeastern Queensland, and nearby islands, usually in mountainous areas. Although most are found in mountainous areas, several species also occur in lowlands, such as the aptly named Lowlands Tree-kangaroo. Most tree-kangaroos are considered threatened due to hunting and habitat loss.